Liv Robles (22) and the Sheehan girls basketball team will face off against Cromwell int he Class M championship game on Sunday. PLAINVILLE — The Sheehan Titans have won just one state girls basketball championship in program history, but you’d have to turn the calendar back to 1976 to find it. They’re about to get a shot at a second title this weekend. Sheehan punched its ticket to the state finals at Mohegan Sun Arena with a 62-59 victory over the Berlin Redcoats in the CIAC Class M semifinals Monday night at Plainville High School. No. 13 Sheehan (19-7) will play No. 2 Cromwell for the Class M championship on either Saturday or Sunday in Uncasville. The time of the game will be determined later this week. 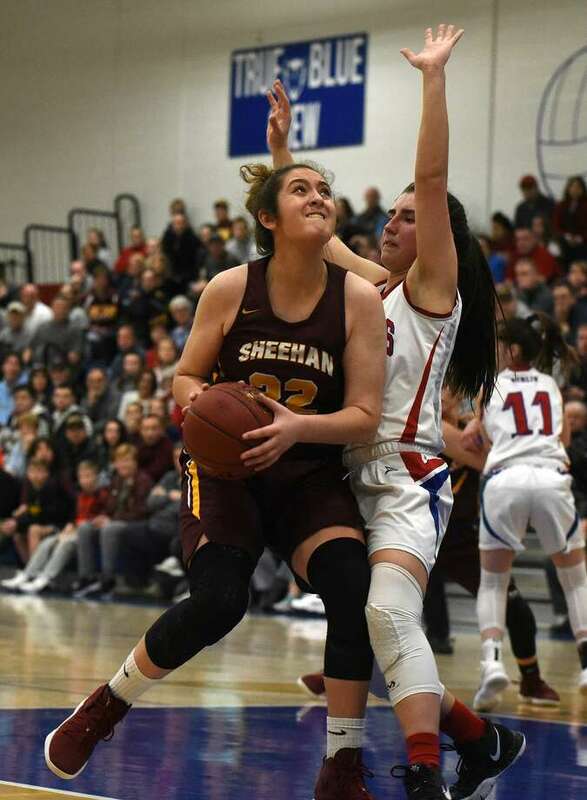 Sheehan senior Liv Robles, who passed the 1,000-point career milestone earlier this season, continued her scorching play, as she scored a career-high 36 points, topping the 30 she scored in the quarterfinals. Caitlyn Hunt, who was in early foul trouble and had to sit out most of the second quarter, still finished with 10 points. The Titans are making their first trip to the state finals since 2000, when then finished as the Class M tournament runner-up with a 53-48 loss to Morgan in the title tilt. For No. 8 Berlin, the loss ended their season at 20-6. Lyzi Litwinko led the Redcoats with 24 points, Angela Perrelli had 15, and Ashley Wenzel had 14. The game was a true seesaw battle of runs and momentum shifts. Sheehan had an early 15-9 lead before Berlin closed the first quarter on a 10-2 run for a 19-17 lead. The Redcoats then went ahead 33-23 in the second quarter, only to have the Titans respond with a 10-3 spurt to close the gap to 36-33 at halftime. Sheehan regained the lead at 48-46 after three quarters, and pushed the advantage to six at 55-49 before the Redcoats scored seven straight to go back in front at 56-55. With Sheehan leading 57-56, Litwinko hit the second of two free throws to tie the score with 1:30 to play. Robles then scored at the other end and added a free throw moments later for a 60-57 lead. Wenzel scored for the Redcoats, who then fouled Caitlyn Velez with 15.9 seconds remaining. Velez hit the first free throw and missed the second, but Robles came up with the rebound and drew another foul. Her ensuing free throw made it a three-point game, and when Perrelli’s three-point attempt fell short in the final seconds, the Titans had their win and a trip to the final. Liv Robles, Sheehan — Robles has racked up 66 points in the last two playoff games, scoring a career-high 36 against Berlin. She had 21 points in the first half to keep the Titans in it, and helped close it out with seven in the fourth quarter.